We want you to have the security solution that is perfect for you. 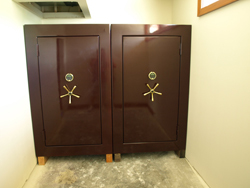 If you have something special in mind or perhaps have certain requirements to meet, we can custom design a gun safe or vault for you. Choose size, color and type of door. Need extra security? You decide thickness of the safe's body, bolts, and hard plate. Want maximum fire protection? We can create your fire resistant security solution complete with double steel interior. Just call us and we're happy to walk you through the customization process to create a safe or vault that is uniquely yours.